Now, the world’s number one polluter brings you: porcine mass graves. That was the foul-smelling surprise environmental inspectors unearthed in the eastern province of Zhejiang last month during an inspection linked to Beijing’s much-vaunted war on pollution. On the rural outskirts of the city of Huzhou officials found a clandestine burial site where the carcasses of tens of thousands of diseased pigs had been illegally interred. The anonymous whistleblower who alerted officials to the crime said it was not clear quite how many putrefying pigs had been buried. “But there must be so many as the stink was so strong that it caused several excavation workers to throw up,” they were quoted as saying by the Chinese magazine Caixin. China’s official news agency, Xinhua, said about 300 tonnes of diseased pig carcasses were thought to have been dumped in the area. The whistleblower told Caixin he suspected tens of thousands of dead animals lay beneath the soil. Since excavations began on 30 August, more than 220 tonnes of animal remains have reportedly been brought to the surface. Reports in China’s state-run media suggested locals had spent years complaining about a rancid and mysterious stench that lingered around their homes. But word of the problem appears only to have reached the environment ministry’s ears last month. Five suspects who worked for a local medical and industrial waste disposal company were detained on suspicion of burying the diseased animals on the slopes of Zhejiang’s Dayin mountain. Xinhua tried to play down the risks posed by the dead animals. 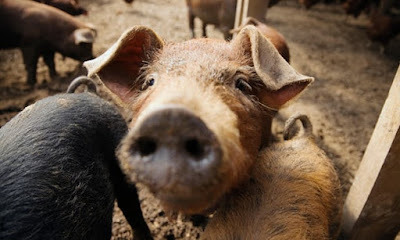 “No human-infecting pig diseases, such as H5 and H7 bird flu viruses and foot-and-mouth disease” were found in samples tested by the authorities, it reported. But Caixin said that authorities had yet to test local waterways and a reservoir for possible contamination. Residents of one village, Qingcaowu, had started drinking bottled water for fear that residue from the graves might have reached their source of drinking water. “Once the carcasses decay, pollutants will certainly make their way into the soil and the reservoir,” one resident said. The villager spoke on condition of anonymity since authorities had reportedly ordered locals not to speak to journalists about the incident. China’s smog-choked skies – which some blame for up to one million premature deaths each year – are by far the best documented aspect of its environmental crisis. But activists say water and soil pollution represent equally severe, if less immediately visible threats. In 2012 one senior official admitted that 20% of Chinese rivers were absolutely toxic. According to the Economist, a 2014 government survey found that 250,000 sq km – an area equivalent to all of Mexico’s arable farmland – had been contaminated by pollutants including lead, cadmium and arsenic. In Zhejiang, Caixin said drone footage seen by its reporters showed the grim clean-up operation that was now under way. Workers in protective clothing could be seen lifting black objects, thought to be decayed pig carcasses, from several large pits. The objects were then loaded into cardboard boxes that were taken away for cremation. A photograph showed one official surveying the putrid scene: his right hand held a camera with which he was documenting the mass grave, his left was clasped over his nose to protect it from the stench.